March | 2018 | Welcome to our blog! Have just promoted our show on the “Where Can We Go website”. I have found it ever so useful when on holiday. Have a quick peek and tell your friends. No not you, it’s a book. 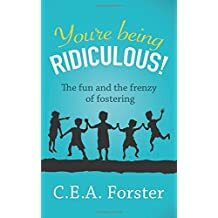 The daughter of our longstanding members Richard and Elspeth Lewin has written an extremely amusing and insightful book on being a foster carer. It can be purchased on Amazon. As they are helping front of house for Hi-de-Hi you can tell them how much you enjoyed it then.